Devotion to the Mother of Good Counsel is associated with the story of a miraculous icon. The sacred image is found in a church in Genazzano, a beautiful town thirty miles south-east of Rome. The church dedicated to the Mother of Good Counsel was built there in the fourth century. In 1356 the church was given over to the Augustinians. Restoration started in 1467, when a widow, Petruccia, sold all her belongings to help finance the project. However, funds ran out before the task was completed. That same year, all the residents of Genazzano heard a beautiful melody coming from heaven. As they looked up, they saw a white, shining cloud that descended on the church of the Mother of Good Counsel. The cloud gradually vanished, revealing a beautiful painting of Our Lady tenderly holding her Divine Son in her arms. Immediately, Mary began to cure the sick and grant countless graces. The news spread throughout the country. Two Albanians from Scutari appeared in the town with a curious tale. They had fled from their homeland to escape the invading Turks. Before fleeing, they had stopped in the church and had seen how the icon of Our Lady, wrapped in a white cloud, lifted off the wall on which it had hung for two centuries. They followed the picture until they could see the towers of Rome, when it suddenly disappeared. The mysterious icon of Genezzano was identical to the one in the church in Scutari. The amazing news reached Rome. Pope Paul II sent two bishops to investigate the story. The prelates reported that 171 miracles were recorded in the months following the icon’s appearance. The pope’s commission also found that there was an empty space on the church wall at Scutari. An icon that had been venerated there for centuries was, indeed, missing. The image was painted on a sheet of plaster so thin that it would have been impossible for any human hand to remove it without damage. It had survived the subsequent centuries through the tumult of several earthquakes and withstood the bombing during World War II. Several altars were destroyed, walls caved in, and the roof was crushed. The icon, only yards away from the explosion, remained intact. In 1753, Pope Benedict XIV established the Pious Union of Our Lady of Good Counsel to promote devotion to Mary under this title. Pope Leo XIII added the title Mother of Good Counsel to the Litany of Loreto. Pope Pius XII dedicated his term of office to Our Lady of Good Counsel. And Pope John XXIII visited her shrine to pray for the success of the Second Vatican Council. The icon at Genazzano is about a foot wide and eighteen inches high. It depicts a mother figure that is half turned toward her son and half toward the viewer, reflecting Mary’s concern for both Jesus and his Church. 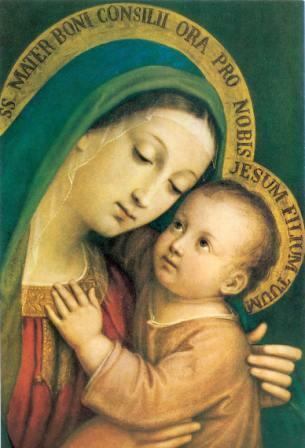 the Feast of Our Lady Of Good Counsel was approved by Pope Leo XIII. For more than 500 years the image has continued to attract of countless pilgrims. Although much of the church was destroyed during World War II, the image has remained intact and continues to be suspended miraculously. If Our Blessed Mother is willing to ask her Son to work miracles to let us know of her motherly concern, Our Lady of Good Counsel is certainly willing to speak words of advice and instruction to help us over the hurdles of our daily lives.